I had seen the Candela product from Vessel at various museum shops a such for a while. I really liked the product. 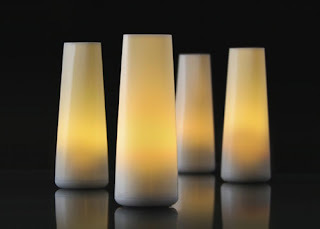 They are sort of a candle2.0 kind of thing. They sit on a inductive charger, when you pick them up they turn on. Put them back and they turn off. Cool ! However, the museum shop price was a bit too steep. One day I was placing an order with a friend from reusablebags.com and they had the Candela for about 40% off. Sweet. Recently they went a little funny though. I had one light that started turning on (instead of off) when placed back on the charger. It turns out the charger went bad and as their batteries died each light would not charge and instead just flickered madly on the base. I wrote to Vessel customer support. I honestly was not expecting much, just hoping for a good price on a new charger. To my surprise, they are mailing me a new charger at no cost ! With all the poor customer service in this world (I'm looking at you Target! ), I really appreciate places that provide good service.